I can’t believe this is the first pomegranate recipe I’ve made this holiday season. I mean ‘tis the season to eat pomegranates! These cheese ravioli with roasted Brussels sprouts have a to die for pomegranate balsamic reduction that adds just the right amount of sweet and sour to this beautiful holiday dish. Of course there is also the fact that this recipe dons festive red and green colors. Who could resist? My family loved it. Actually, my husband was eating it right out of the pot! He is a bit of a pasta addict, so I wasn’t surprised. 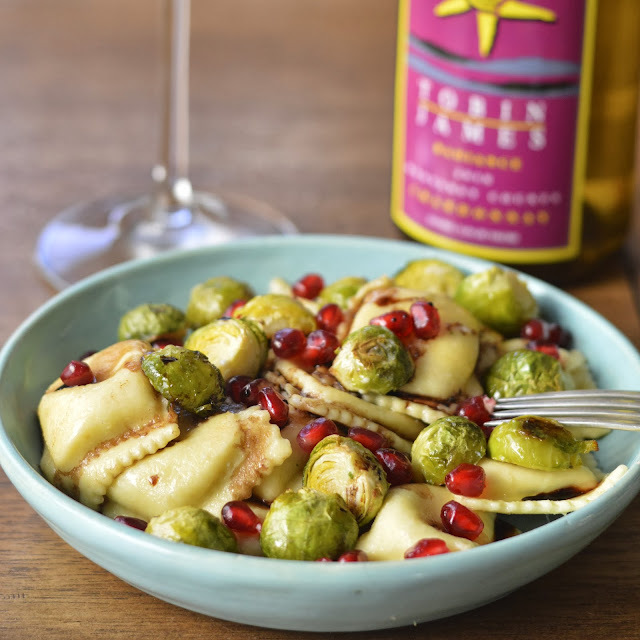 This would make a wonderful holiday side dish or entrée. And I promise you, this pomegranate balsamic reduction has a wow factor. The burst of fruit and sweetness lends itself to so many different recipes. I think it would be amazing drizzled over goat cheese on grilled crostinis. Just sayin! 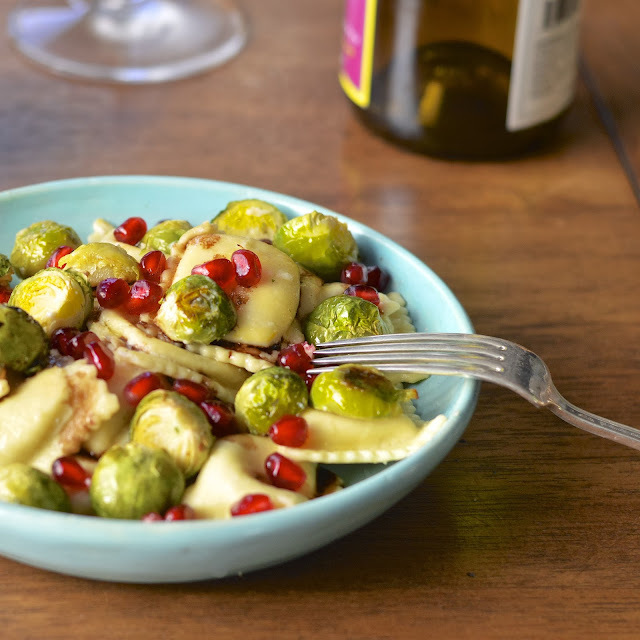 You don’t have to wait for Christmas - make this dish right away! I could have put twice the Brussels sprouts in because I am a true lover, but I wasn’t sure everyone shared my passion. You can also serve extra balsamic reduction on the side for dipping. It’s that yummy. Preheat oven to 400 degrees F. on a sheet pan toss Brussels sprouts with olive oil and salt. Roast for 10-15 minutes depending on size of sprouts. Bring a large pot of salted water to a boil. Cook ravioli for 3 minutes or according to package directions. drain and set aside. In a medium saucepan combine balsamic, pomegranate juice and brown sugar. Bring to a boil and then let simmer on medium low for about 15 minutes. It should reduce by half and have a syrupy consistency. In a large pot melt butter (you can brown the butter at this point to add more flavor). 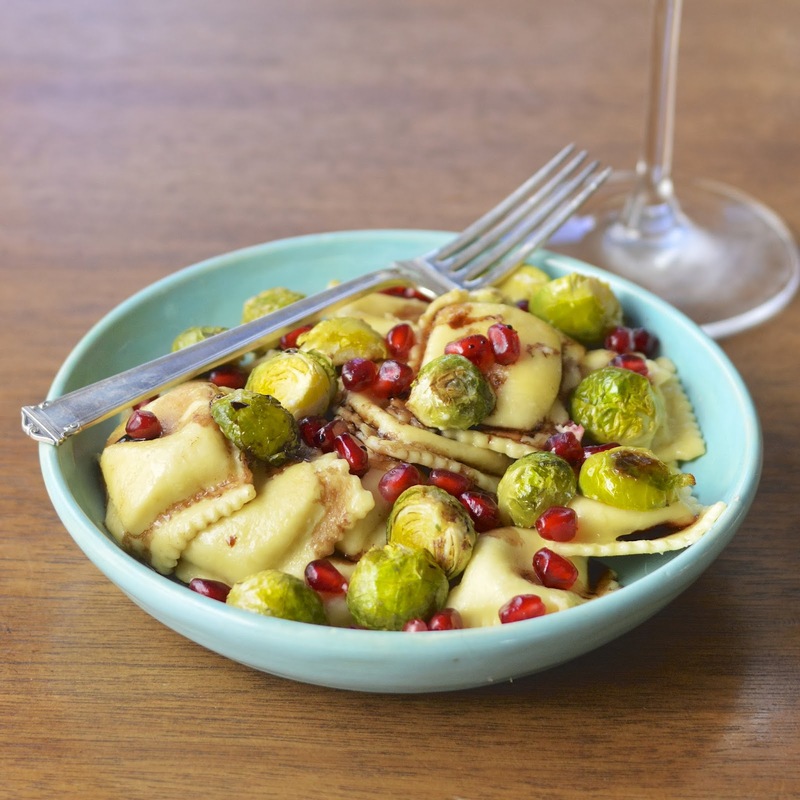 Add 1 tablespoon of oil, brussels sprouts and ravioli. Heat on medium until warmed through. 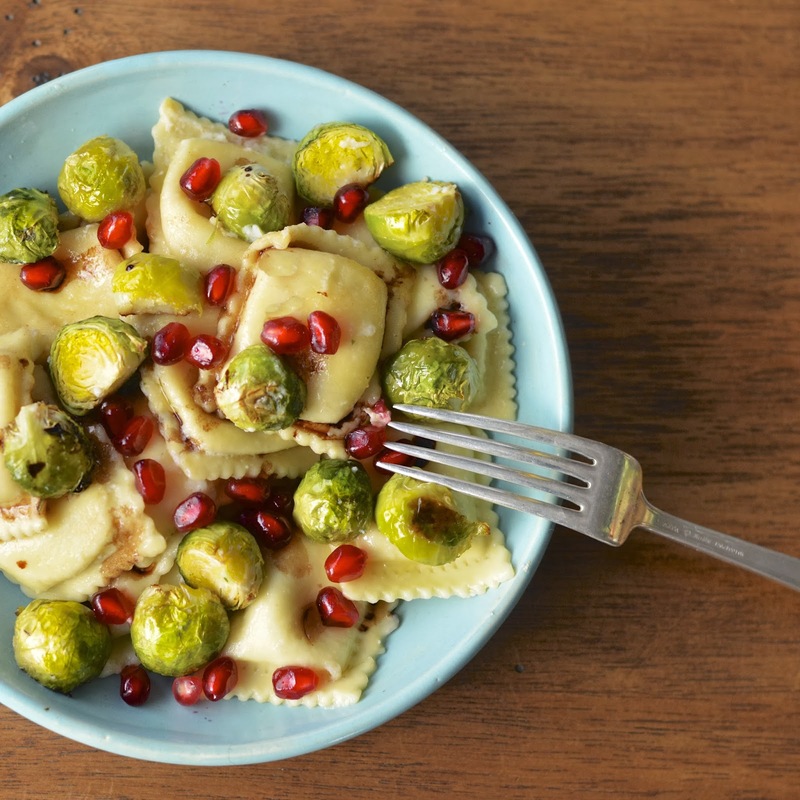 Serve and drizzle with reduction and sprinkle with pomegranate seeds. Salt and pepper to taste.